Tracey Calhoun, 200 RYT, strives to design a welcoming space for all individuals, regardless of age or body type, to practice yoga and meditation. Students will find classes to be balanced, creative, and infused with humor and fun. Tracey came to yoga at the onset of the 2007 financial crisis. As a commercial lender in the Large Corporate Division for a regional bank, the demands of the job, the increased demand of clients, additional monitoring of all clients as well as, the 40-mile daily commute each way were beginning to take their toll. As the stress increased, sleep decreased, and anxiety became a daily way of life. There had to be a change; this was not a way to live ! An opportunity to attend a six-week Intro to Yoga class turned out to be a life changing experience. Initially she wasn’t sure yoga was going to be the answer to reducing stress and anxiety going into it. After all she was a suit in corporate America who lived within very defined boundaries! WRONG! Upon entering the very first class to a warm and very welcoming environment, she felt as if she was home. With a glance to the past and only the future to look forward to, this foray into yoga was the start of learning how to settle the mind and reduce stress and anxiety. Tracey is passionate that yoga is for everyone and every BODY! Tracey’s style of yoga uses mindful movements linked to breath, proper alignment, modifications and the use of props to ensure all participants can fully enjoy each class, and access the benefit of each posture regardless of physical condition, age or their experience level. Tracey is a member of Yoga Alliance. 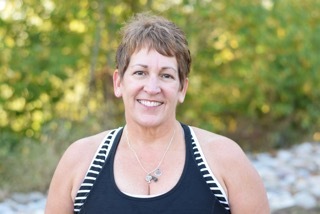 She received her 200 RYT at OM MY YOGA in Camp Hill, PA. She also completed Yoga for All training, learning how to create body positive yoga classes for all shapes, sizes and abilities as well as, Yoga for Anxiety for Adults and Teens. Tracey and her husband, Joe reside in Dauphin with their Labrador Retriever, Millie. When not in the studio, you can find her working in the garden, walking, cooking, or searching for cheap flights to Hawaii to visit their daughter.